When we first heard rumblings about the Keanu Reeves Squarespace ad we honestly didn’t know what to expect. It seemed like an odd pairing, for starters. Would these ads lean into the beauty that is Keanu Reeves? Would they highlight his strengths as a star — his physicality, grace, and overall coolness? Would they be eye-catchingly weird? The answer to all three is a resounding yes. The teasers released last week were noticeably bonkers, featuring Reeves talking to various versions of himself for advice and chilling at a meditative campfire retreat. The in-game spot for this year’s Super Bowl is a thing of beauty for a very different reason. It leans into where Reeves excels: action. That balancing on that motorcycle while cruising down the highway stunt? Reeves did it himself. 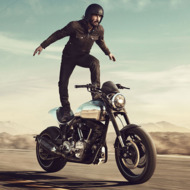 If you’re wondering why Reeves paired with Squarespace, this quote given to Vulture can help clear things up, “For me, it all began with the love of riding motorcycles. Turning that into a business really came from wanting to be a part of creating something that I wanted to take into the world. Once your passion becomes something you share with a larger audience, there’s a kind of professionalism you have to project. That professionalism factors into how you design your website.” The blend of action, weirdness, and that particular brand of Reeves coolness makes the ad addictively watchable. We can’t turn it off.